Newsflash Jesus saves! Well crosses do anyway But from what exactly? Evil, yourself, mass hallucinations? With an intriguing trailer, a slightly dystopian backdrop of a washed out logging town and the surreal character of known of Ignatious Parish, or Ig as he known to his friends, who awakes hungover one morning to find horns growing out of his head, this film did not turn out to be what I expected. Somewhere beneath it all there was a moralistic tale, interwoven with not so subtle Christian ideology. It started great and ended flatly. Predicatble from the beginning and repetitive by the end. 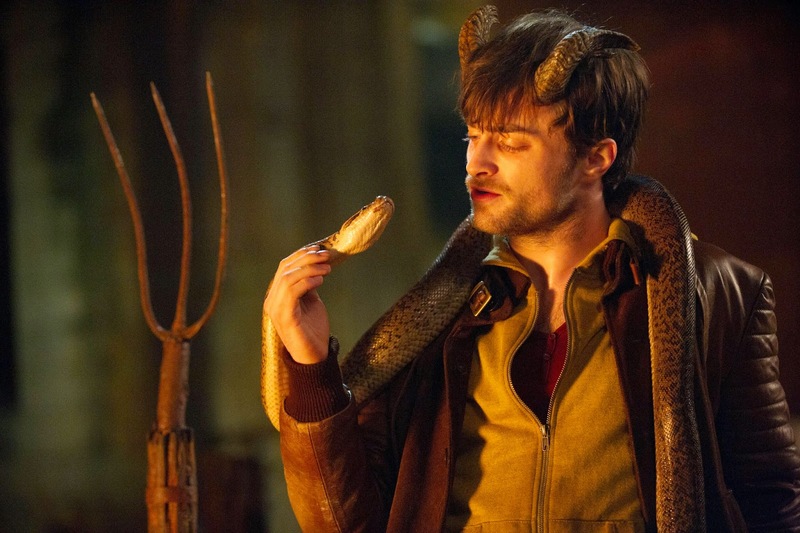 I'm sorry I really wanted to like this, and in parts I did, but the worn out whodunnit drama over took the fantasy and I began to see why they called it Horns as that was all that separated it's plot from that of a Lifetime movie. The whole town suspects Ig of killing his childhood sweetheart Merrin, played by Juno Temple. She first caught Ig's eye in church, bouncing the light off her cross to send him messages in morse code. Merrin is the ethereal and pure Eve like figure, her murder turns the town against Ig, and Ig, so desperate to prove his innocence somehow invokes a certain amount of helpful evil. His horns have the ability to make people confess there worse thoughts with a humorous honesty that Ig uses to try and get to the bottom of his true loves murder. What I learnt from this film is people do bad things, good people do some bad things, theres a little devil in all of us, but crosses protect us from evil, even if that evil is ourselves? I don't know. Go see it for yourselves, there is plenty of beautiful cinematography, great acting, some interesting biblical references and really funny moments. But do not expect to be enlightened… you literally finish the film where you began.